Labeling Machine Plays A Pivotal Part For Customer As It Exaggerates The Product. Labeling & Packaging Should Be Able To Embellish A Product To Add To Its Visual Appeal. 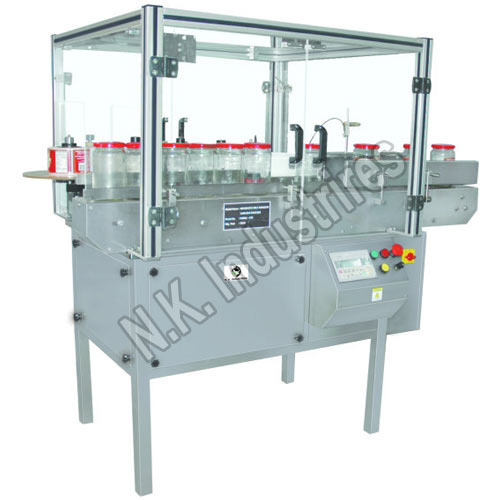 N.K Industries Manufacturer Eminence Sticker Labeling Machine Which Is Mostly Used To Apply The Self-adhesive Type Sticker On Multiplicity Shape Of Container Like Round Bottle , Flat Bottle , Pet Bottle , Glass Bottle , Glass Ampoule As Well As Glass Vial. Our Offered Range Of Sticker Labeling Machine Are Extensively Used In pharmaceuticals, Chemicals, Cosmetics, Pesticides, Food & Beverages And Packaging Industries. Round Bottle Labeling Machine Are Available In 120 Container Per Minute Speed, 240 Containers Per Minute Speed Segment. Vial & Ampoule Labeling Machine Are Available Up To 450 Speeds Per Minute Models. Automatic Front And Back Labeling Machine Are Very Useful For Flat Bottle Labeling As This Model Apply Two Label Simultaneously On Front And Back Side Of The Bottle And Model Available In This Segment Are 120 Container Per Minute And 240 Container Per Minute.